The picture above shows three bars. The top two bars are wax cups in wooden bases, with the lower bar utilizing plastic queen cups. This picture was taken about 24 hours after grafting all three bars. The take rate was the same for both plastic and wax cups. We had thought if we grafted two separate frames in two different hives, we may get the same rate. But for a case where the bees could build in the cells they desired, and a case where different bars were of both wax and plastic cups, that they would gravitate towards the wax over the plastic. We did not find this to be the case. with and without royal jelly? 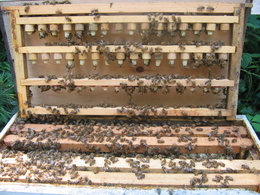 The left side of the top two grafted bars contained royal jelly. 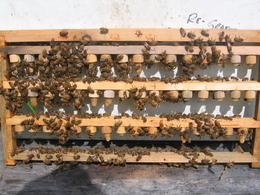 The right hand side of the top two bar as well as the bottom bar, contained diluted honey for the larvae to be grafted. We use diluted honey very effectively in many of our grafts. What we found out, is that any cells that had a grafted larvae utilizing royal jelly was continued and completed by the bees. Of the remaining 31 grafted cups with diluted honey, only 3 additional cells were built. The smell and recognition of cells previously fed royal jelly far outweighed the fact that other cells were positioned corrected and contained a grafted larvae. Pheromones from the royal jelly trumped larvae in other queen cells. Copyright © 2010-2011 Bjorn Apiaries. All Rights Reserved.